This is a 4-channel microphone preamp dating from around the late 60's / early 70's I would guess. Interestingly, it was build right here in Sydney - Homebush to be exact. In fact, I am always driving past it's birthplace - the big Kennards at the end of the M4 motorway used to be the EMI pressing plant and factory. I can remember as a kid driving past when it was a big white building with the giant blue "EMI" painted on the front. Anywaaaaaaaay, I've had this for about 10 years and it's been one of the best sounding and dependable pieces of gear in my collection. When I bought it, it was a kinda funky and dirty sounding 4-channel mic mixer that summed down to a mono output. However, after a trip to Rob Squire in Adelaide (check out his fantastic work here) the unit came back with 4 direct mic outputs along with useful updates such as phantom power, pad, and phase reversal on all channels. The best part is that it's pretty much one of the best preamps I've ever heard with a good honest clean, yet big sound. It has been used as the main pre on every album I've produced over the last 10 years, particularly when we're talking drums and guitars. Well, here is a more recent acquisition that I'm still kinda in the honeymoon period with. It's super useful, like wow. It's a 2-channel mic/line preamp with EQ but wait, what's this? Each channel has 4 different mic pre's to choose from, each from classic consoles / hardware from the past. The "TUBE" one is recreation of an old RCA tube preamp from the 50's, the "GE" is based on the first english Solid State Germanium console from Olympic Studio(! 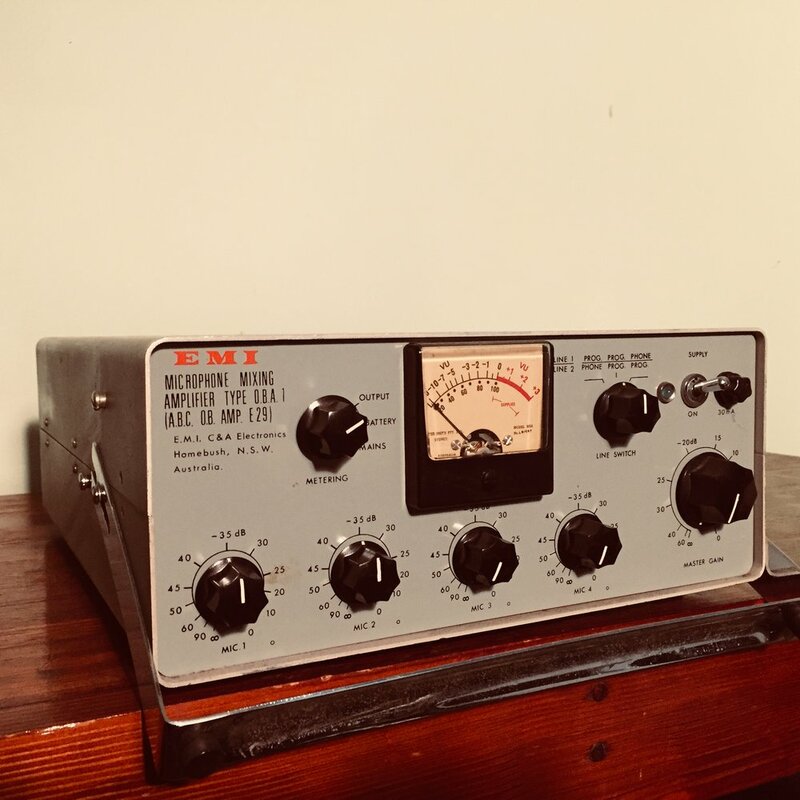 ), the "Cooker" is the circuit that Joe Meek used to distort stuff but it works as a preamp fine too, and the "SI" is an old Altec circuit from the 60's that I understand was the next evolution of John Hall's classic Langevin AM-10 design. The EQ is an inductor one based on the old EMI REDD desks with extra frequencies taken from the EMI Presence Box's. Awesome. This thing is so handy for recording and also for mixing. Each of the preamps are really individual and suit different purposes. Using this thing as the makeup gain for a passive mixer is crazy good - so many tonal options. I could never find these for sale anywhere in Australia so I picked up this pair on my last trip to Manhattan. I don't have much to say about this mic other than they rule (ask Cloud Control - they have one and it's all over their last album, Zone). This is a cheap and cheerful, now discontinued condenser mic that was a collaboration between EV and Blue. I bought it for next to nothing at some hock shop in San Francisco many years ago. It was used, dented but looked cool so I bought it. I don't know what it is about this mic, but it sounds really good. Really, really good. It is inherently a little bright, but when you pair it with the right preamp it can do some amazing things. Fuller sounding preamps like my Electrodyne or 610 work well here. Vocals, acoustic guitar, under snare are all places I love using this thing. Who would have thought? Ok so this has a bunch of different gear inside it, but they are all compressors and they are all really useful. 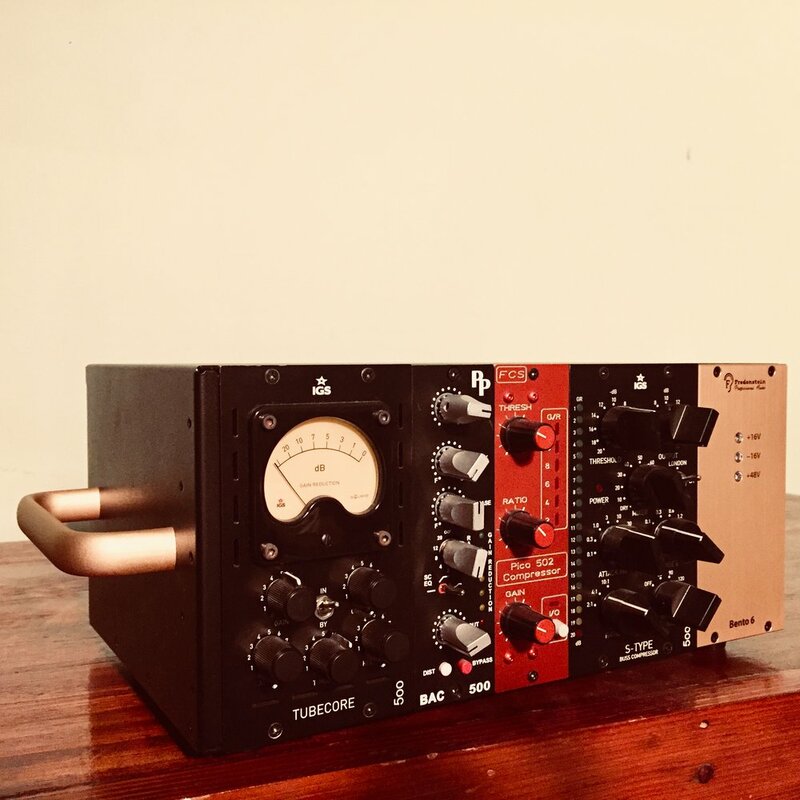 There is an IGS Tubecore all-tube vari-mu compressor, a Pete's Place BAC-500 FET compressor, a Foote Control Systems VCA compressor and an IGS S-Type SSL-style bus compressor. I want to make a shout out to my favourite 2 in here; the Tubecore - an absolute killer compressor that is quickly becoming a real standout for me, and the BAC-500 - this is my secret weapon, but I can't say how I use it because then it's no longer a secret, you see. I purchased these mainly due to my fascination of the album 3rd/Sister Lovers by Big Star which was recorded in the well known Ardent Studios in Memphis in 1974. The sound of this album along with the other Big Star records has intrigued (haunted?) me for nearly 20 years, so when I saw 4 racked channel strips from the very same model Spectra Sonics console that recorded and mixed that album come up for sale, what could I do? But wait, what's this? These have that sound! They actually do. Even more so when you crank up the top end on the EQ, it's pretty uncanny. I don't like travelling these around as much as it's not quite as robust as some other pieces, but I did use it a hell of a lot on the Rolling Blackouts Coastal Fever album last year. All the drums along with lots of guitar and vocal overdubs I used this thing. It's really a lovely slice of 70's USA console action and when I can record with it, I do, otherwise I use it's magic during mixing. This is an old ex-ABC unit that I picked up nearly 10 years ago and since then it has been a work horse. In the past I used to mix down onto this machine, but I find it's real enduring strength is as a tape echo. I mean, it just sounds incredible. So during mix time, I will use this to slam tracks down on to for some of that tape sound, then often use it in real time as an effects send from the console for that aforementioned, magical tape echo. I really went crazy with this when mixing Bliss Release by Cloud Control and Crystal Theatre by Belles Will Ring.